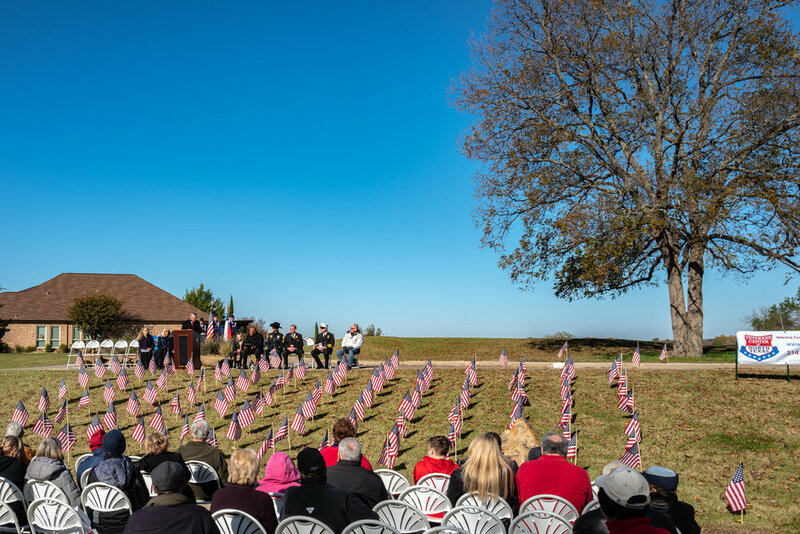 On Saturday, November 10, 2018, the day before Veterans Day, residents of Heritage Ranch and the Veterans Center of North Texas, observed Fairview’s first Flags of Honor Ceremony conducted on a stately hill adjacent to the “Wedding Oak” at Heritage Ranch, a 100-year-old massive oak tree that serves as the site of dozens of weddings every year. Lone flag of Great Britain in honor of Martin Kiaiser who served with the Royal Air Force (RAF) from 1939-1945. The day dawned clear and very cold, the first freeze of the season saw temperatures hovering around 30 degrees. 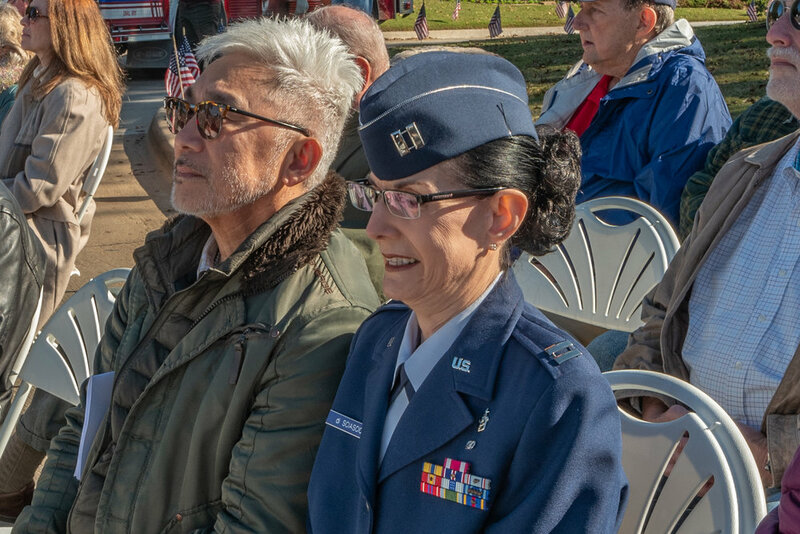 Despite the cold, however, approximately 100 veterans and their families assembled at 10:00 a.m. to pay homage to all of the veterans of the families residing at Heritage Ranch, including Galusha Pennypacker who served in the Civil War between 1861 and 1863. Fairview City Councilmember and Mayor Pro Tem, Paul Hendricks welcomed the group. Hendricks also serves as President of the Veterans Center of North Texas. The Rev. Mally Baum, whose father is a 95-year old WWII veteran, delivered the invocation. The colors were then presented by a contingent from the Thunderbolt CAP. Organized in 1930, Thunderbolt is a Civil Air Patrol Composite Squadron consisting of both cadet and senior members and is located at the Lovejoy ISD Administrative Building in Allen. Raegan Haring, the grandchild of a Heritage Ranch resident, led the Pledge of Allegiance and Shirley White-Stevens sang the National Anthem. 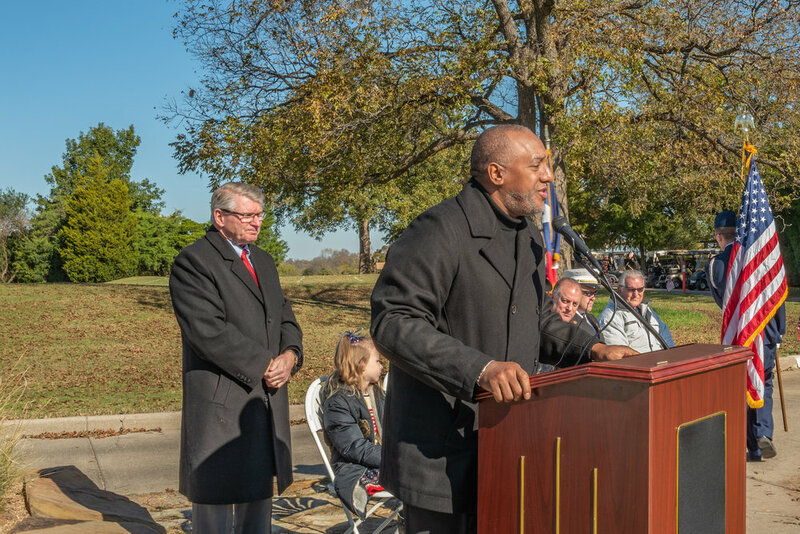 Rick Grady, a Plano City Councilmember and official of the Veterans Center of North Texas, and a twice decorated veteran presented the keynote address. Grady was also honored with the Congressional Veterans Commendation by U.S. Congressman Sam Johnson in 2017. Grady explained that Veteran’s Day began as Armistice Day, marking the cessation of hostilities in WWI at the eleventh hour of the eleventh day of the eleventh month (November 11, 1918). In 1954, President Dwight Eisenhower, the Supreme Allied Commander during WWII, changed the name of the national holiday from Armistice Day to Veteran’s Day to honor all Americans who have served in the nation’s armed forces. Despite the cold, about 100 attended the Flags of Honor Ceremonies. A Flag of Honor, a total of 104, was displayed for each Heritage Ranch veteran and family members who served in the military. One of the flags, however, was the Union Jack of Great Britain in honor of Heritage Ranch resident Martin Kiaiser who served in the British Royal Air Force 1939-1945. All of the veterans’ names were read aloud by Fairview Mayor Darion Culbertson, Mayor Pro Tem Paul Hendricks, Fire Chief Jeff Bell, and Fairview Police Sergeant Troy Neasbitt. It should be noted, however, that the list was compiled only from among those Heritage Ranch residents who reported themselves as veterans. The community has many more veterans residing who did not to self-report. To close the ceremonies Taps was played by veteran Al McGee of Heritage Ranch. Heritage Ranch resident Al McGee plays Taps to conclude Flags of Honor ceremonies.